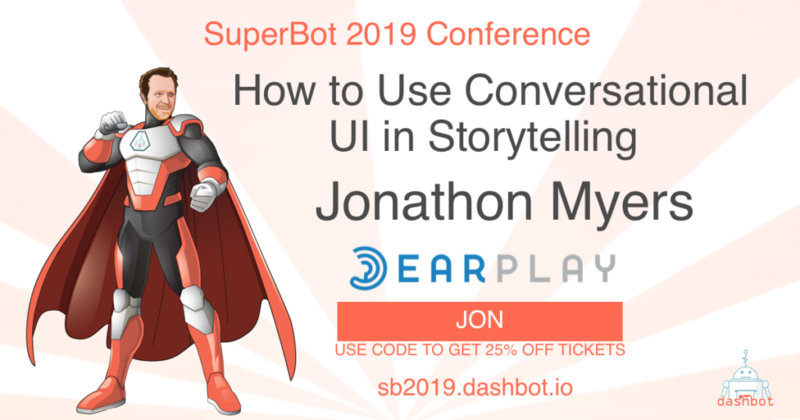 We’re thrilled to have Jonathon Myers, founder of Earplay, joining us at SuperBot 2019 to share his insights on the future of the voice space. Jonathon is the CEO of Earplay. He also is an interactive digital storyteller, voice first product manager, and a leader in the voice industry. He began his career in interactive entertainment as a creative writer (MFA, Boston University) and Boston-based independent game designer, eventually working with story properties like Indiana Jones, Game of Thrones, Futurama, Mr. Robot, Jurassic World, and more. In early 2013 he co-founded Earplay to work on a platform for the creation and distribution of voice operated interactive story experiences.